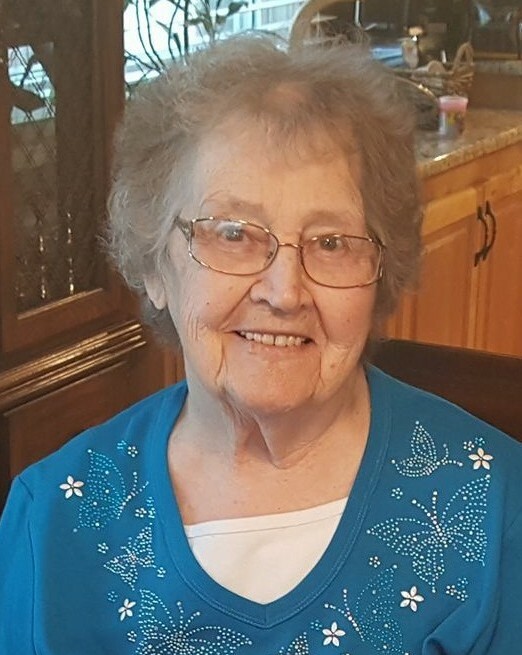 Martina Gerritsen of Nampa, Idaho, passed away on August 12, 2018 in her home surrounded by her grandchildren. Martina was one of nine children born on April 13, 1920 in Ogden, Utah to Heino and Arentje Groen Dallinga. Martina grew up and attended school in Ogden, Utah. On November 3, 1937, she married Peter J. Gerritsen in the home of her parents in Ogden, Utah. Peter and Martina soon moved to Nampa, Idaho where they raised four daughters, Barbara, Martina, Cheryl and Darlene. Martina was a homemaker who enjoyed working in the home. She also worked side by side her husband doing ornamental iron manufacturing. They resided in Nampa until 1972 when they moved to Kimberly, Idaho. Pete and Martina enjoyed camping and fishing. After Pete retired, they purchased a 5th wheel and boat. They spent summers camping at Blackfoot Reservoir with friends and family. With the passing of her husband Pete, Martina moved back to Nampa in 1996. In 2008, Martina sold her home and moved in with her granddaughter and grandson-in-law, Valerie and Eleazar Munoz, where she resided until her death. Our grandma was the most giving person. Through the many years of her life, she blessed so many of us with not only material needs, but she blessed us with her kindness and thoughtfulness. Martina believed in and loved the Lord with her whole heart. We always had comfort in knowing that grandma was covering us with her prayers. Until the day of her death she prayed for her loved ones. She said and believed one of the reasons she was blessed with a long life of 98 years, was because she was meant to pray for her family. Grandma cherished her family. Grandma, you taught us so many things in life. Because of you, we all know how to clean!! You told us, clean the corners and the middle will take care of itself! You taught us that if we were going to do something, we should do it right the first time. You taught us by example of how to be selfless. You would do without, so that you could give to those you loved. You will be in our hearts forever. I will never be able to look at a tulip and not think of you. We know you are at peace and reunited with your family. That is what gives us the strength to go on without you. Rest in peace granny girl, until we meet again………. Martina is preceded in death by her husband, Pete Gerritsen; her four children, Barbara Boles, Martina Canfield, Cheryl Koeppen and Darlene Schoen; her parents and her brothers and sisters. She is survived by her grandchildren, great-grandchildren, great-great and great-great-great-grandchildren. Graveside services will be on Saturday, August 18, 2018 at 10:30 AM at Hillcrest Memorial Gardens, 15862 Indiana Avenue, Caldwell, ID 83607.